Tapered Thermaroof®-3 improves roof drainage as designed with standard slopes of 1/8”, 1/4” or 1/2” per foot. Tapered systems utilize flat Multi-Max® FA-3 to build up thickness for roof design. 1Flame Spread and Smoke Developed Indexes are used to measure and describe the properties of this material in response to heat and flame under controlled laboratory conditions and should not be used to describe or appraise the fire hazard or fire risk of this material and other related roofing components under actual fire conditions. 1The 1.50" and thicker products are approved for FM Class 1-90 wind uplift. 2Not for direct application to steel roof decks. 3LTTR values are determined in accordance with CAN/ULC-S770. LTTR predicts a 15-year, time-weighted average. 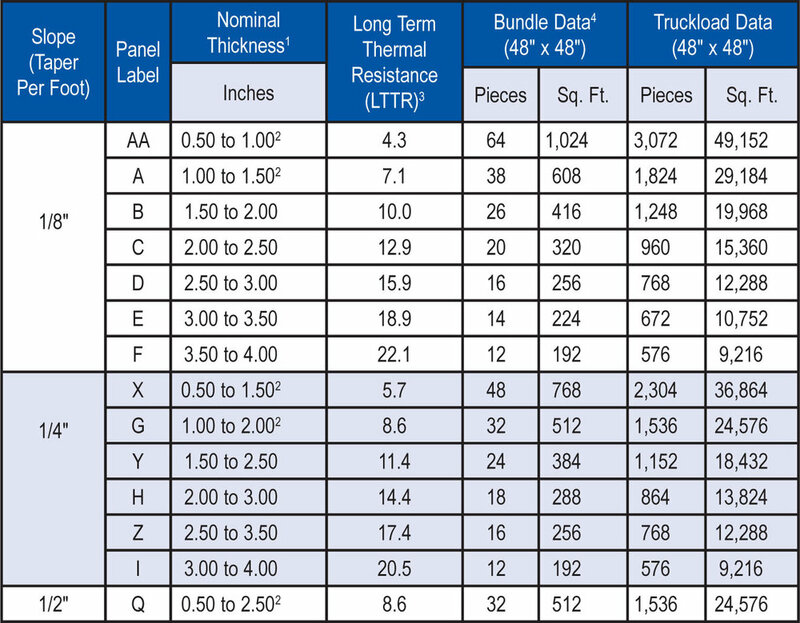 4Tapered Thermaroof®-3 is shipped in bundles that are approximately 48" high and wrapped in plastic for easy handling. NOTE: Metal deck flute span shall be a maximum of 4 3/8"